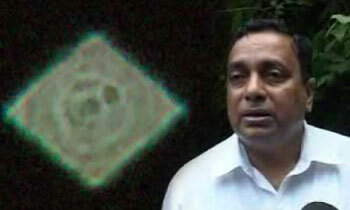 Despite reports of Unidentified Flying Objects (UFO) being sighted in several parts of the country there's not enough information to form a definite opinion about the phenomenon, Dr. Chandana Jayaratne said yesterday. Dr. Jayaratne of the Department of Physics, University of Colombo, said there was insufficient information about the sightings which after all could have merely been the appearance given by Drones passing over areas in which people have not seen Drones before. He added that inquiries have come to a halt as no possible conclusions could be made on the basis of studying unclear pictures of the sightings last Saturday..
Dr. Jayaratne said that the lack of plausible information made it impossible to ascertain the nature of the object in the pictures. However, he added that several field studies are being conducted to collect eyewitness reports of the sightings.